So, as you all know, I have been working diligently in my basement for the past couple of months. 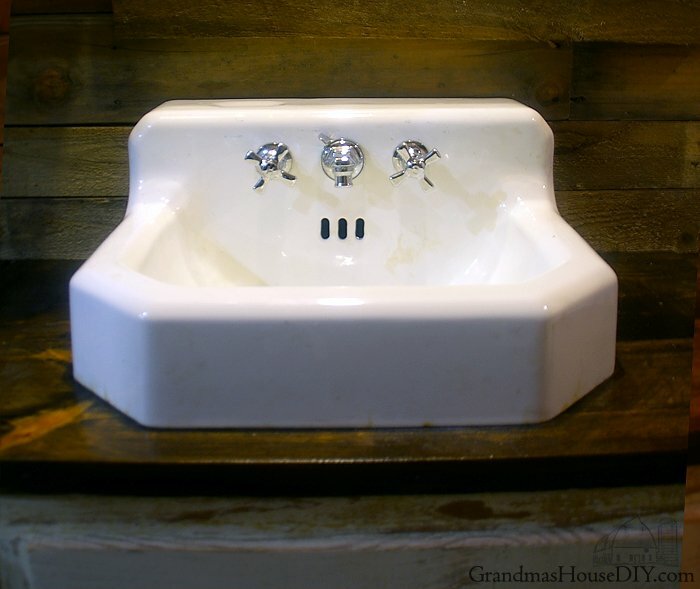 For the bathroom I had set aside my grandparents’ old bathroom cabinet and this gorgeous, ancient, American Standard, cast iron sink! It was in one of the sheds and though I don’t know exactly how old it is my guess is between 40-50 years. 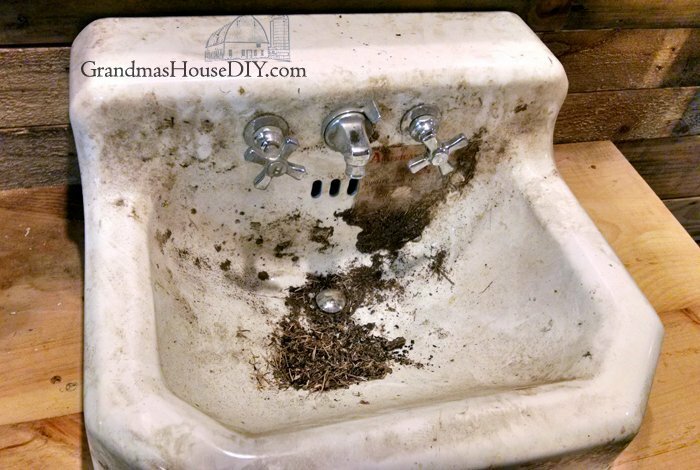 When I posted about our kitchen sink base, I had lots of questions on how to clean cast iron because, like this one, it was SO GROSS. So I rolled up my sleeves and took lots of pictures of the process this time! 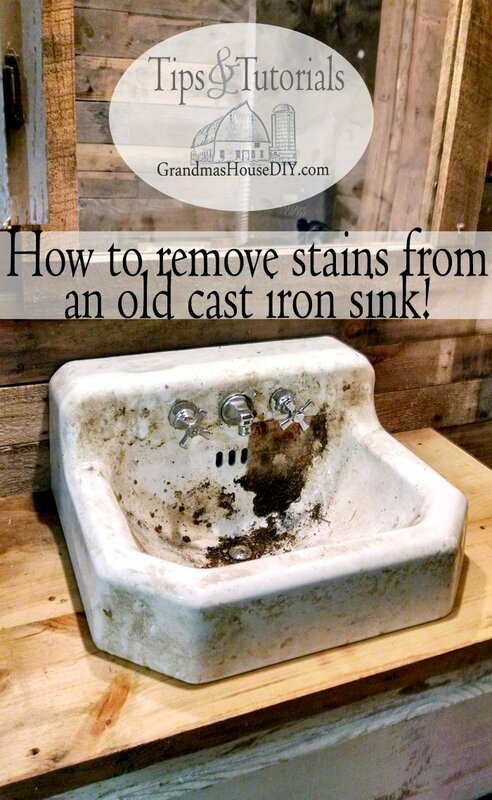 So, this is how I removed stains from and clean cast iron sinks that are covered in total nasty! 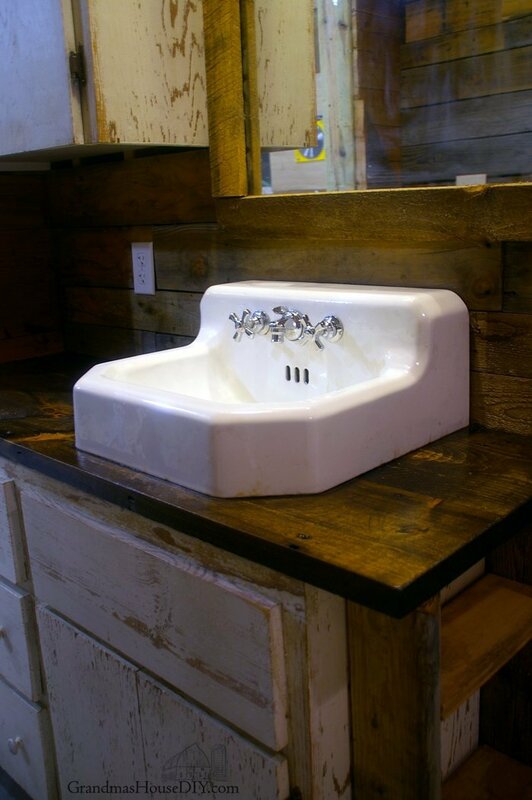 But first, check out this amazing sink! It was literally still in the crate it was first boxed in from the factory! Even the old wrapping around the hardware was still there! It pained me a little to remove it from the crate because every board was so cool and so old. (I saved every board and the crate for a later project.) 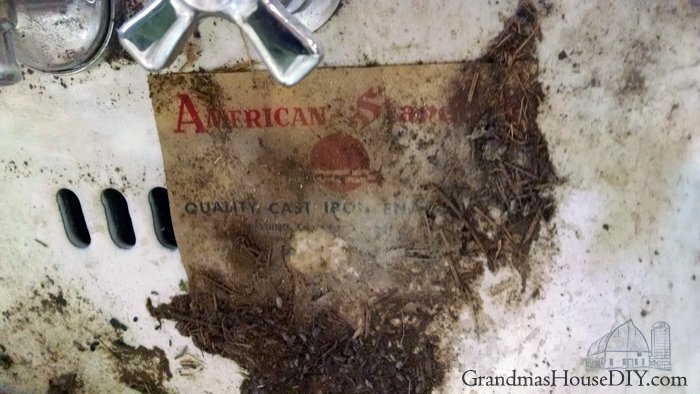 Even the old American Standard label was still stuck to the front of it. It also came with a serious amount of ick so I knew it would be a big job to get it clean. First, I got it installed and working, I can’t believe there were no leaks, it works perfectly, even the drain stopper! Really, they just don’t make them like they used to. After that, I got to work cleaning it. First thing was first I got as much as I could without water or anything, just paper towels and some scrubbing to remove all of the dry big nastiness. Then I rolled up my sleeves. When I clean cast iron there are only three things that I bring with me: a scrubby sponge (NOT an SOS pad or anything abrasive!! ), a box of baking soda and a jug of white vinegar. 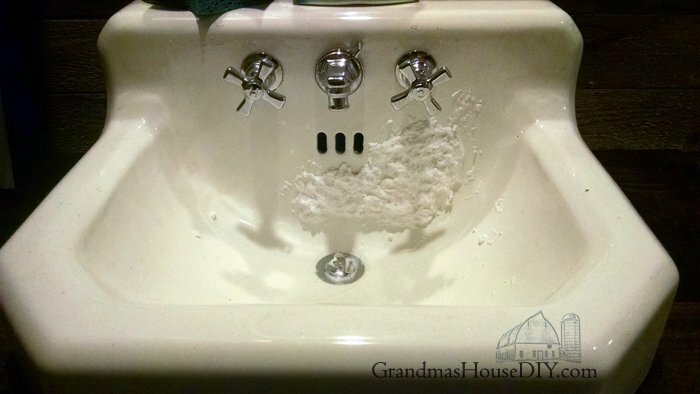 First I covered the whole sink with baking soda and made sure to plug the drain, then I dumped in about a cup of vinegar so everything went crazy sudsy. And then I got to scrubbing. 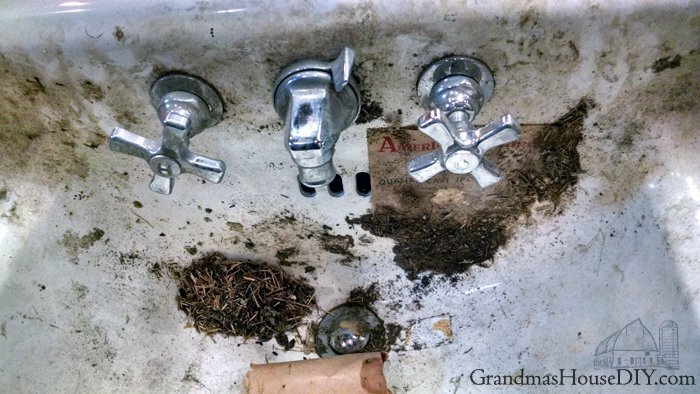 After a substantial amount of scrubbing the sink was looking remarkably better, I got the majority of the worst off of it and dried it up and assessed what I needed to do next. Where the label was there was one heck of a nasty stain that no amount of elbow grease was going to work on so I made a paste with the vinegar and the baking soda and covered it up and left it for about 36 hours. And viola! The stain is almost completely gone! 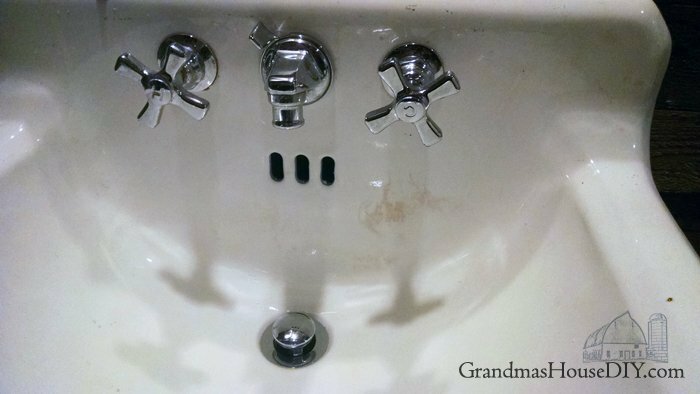 This sink will never again look brand new certainly, but I am really impressed with how beautiful it is. The vinegar and baking soda treatment has impressed me before but now I’m a real believer if it can clean cast iron it can clean anything! I’m so glad you posted this! I’m struggling with my cast iron bath. Tracey, the next step would be to try laying a hydrogen peroxide soaked rag on the stain – I hear it can really work wonders! Hey Sue, thank you for the tip, I do believe I remember seeing a bottle of that in my mom’s old cleaning supplies cabinet. I’ll run over to our local fleet store and grab one, thank you!! Beautiful job! I use baking soda & vinegar on everything. You might try baking soda & lemon juice as well. It works on stains on my kitchen counter with no problems. 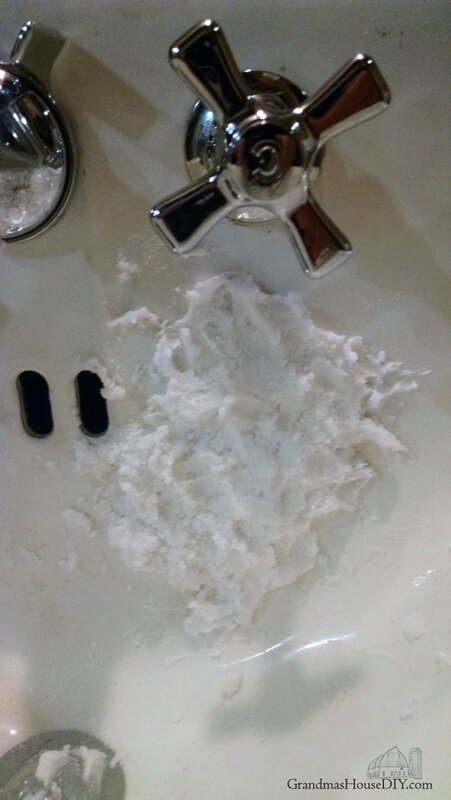 I also use Borax alot to clean my sinks & bathtub if you’re comfortable using it. Jenny, great idea! I didn’t consider trying borax, I use it my laundry soap so I always have a box around, I’ll have to try it! Thanks Nancy for coming by! You might try some whitening toothpaste on some of the stains and scratch marks! It really works on some stains! That’s a great idea Cheryl, thanks for the tip! How do you get the brown, baked on residue from the inside of the glass oven door? I’ve tried several things and have gotten it cleaner, but not completely. I need help!! 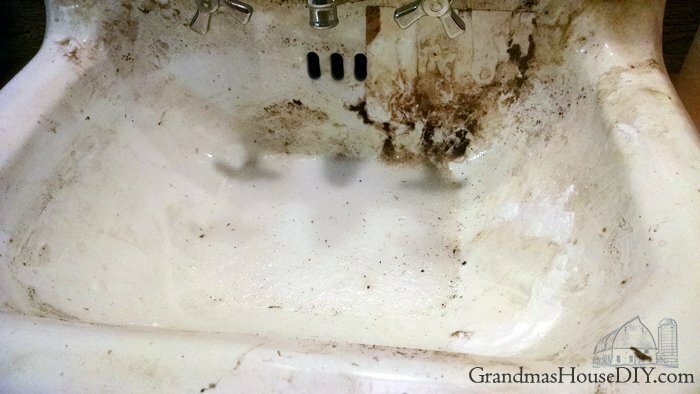 Hey Ruth, in the past I’ve using a water and baking soda combo to make a paste (you’ll only need a very little bit of water) and cover it with that and then let it sit for 15-20 minutes and then get to scrubbing. It’s worked for me but I bet some vinegar in there would probably help as well. Baking soda and vinegar are seriously 2 of my favourite things <3. 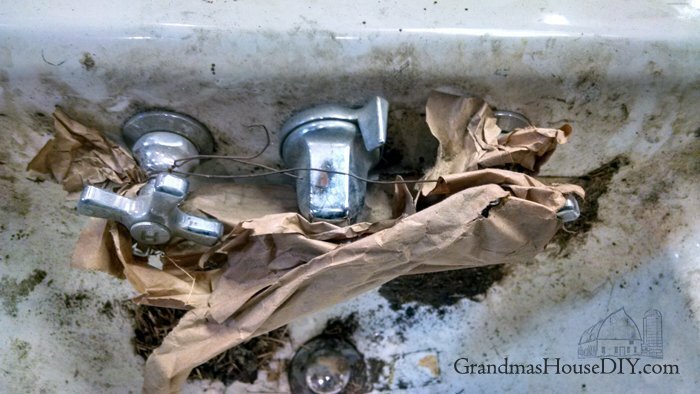 Your sink looks amazing. Me too!! I literally by vinegar by the gallon now lol! 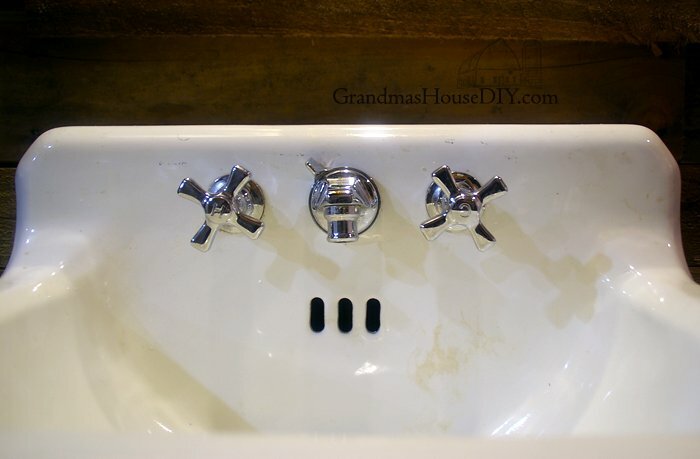 Tarah the transformation of that cast iron sink is just amazing!! I had no idea baking soda and vinegar could be let to sit some days and the effects would still work. Thanks for the tips, pinning to remember! Thanks for commenting Pili, I was really pleasantly surprised at how well it worked! Wow! What a difference! Thanks for sharing on the Pleasures of the NW’s DIY party! Where did you find this treasure. Your absolutely right they certainly don’t make things to last like they use to. This sink is so funky and fun. Love it. I often use baking soda and vinegar but have never been patient enough to try it for more than a few hours. I will certainly be following your method going forward. Thank you very much for joining the #HomeMattersParty. PS. I saw the instagram pic of the absolutely gorgeous horse and followed you. Give him a carrot for me please, hes adorable!! Thanks Leanna! We actually pulled it out of one of our sheds, I can only imagine why my grandpa must have stashed it there – did he have the plan to use it some day? I don’t know! So glad it was there though, I literally squealed when I spotted it! Wow, what a transformation! 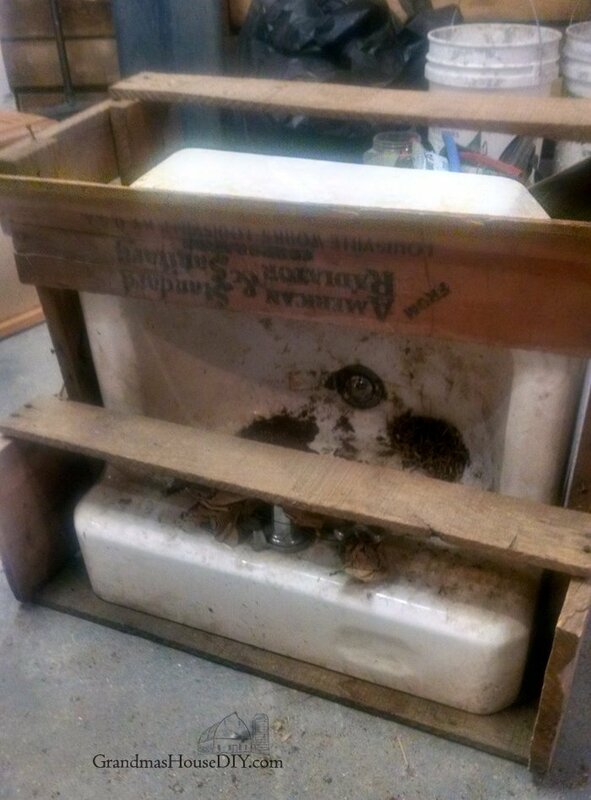 I have an old sink that I have used as a planter outside and now I want to add it to my she shed. This will come in handy when I go to clean it. Thanks for sharing your tips with SYC. 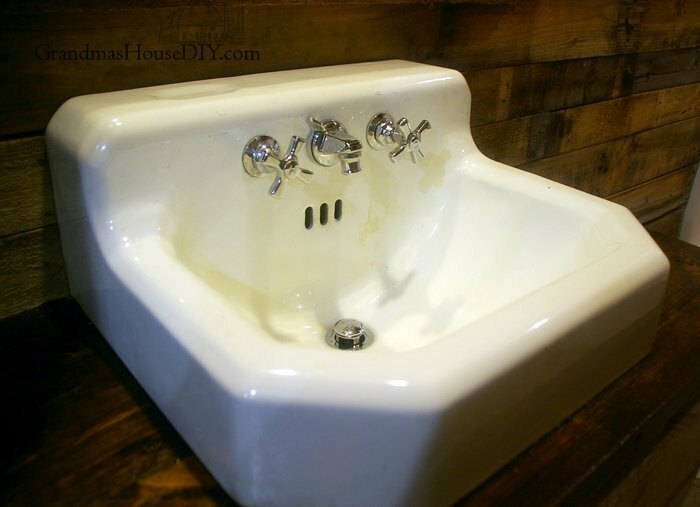 What a great idea Jann, I’ve been thinking about thinking an old sink that I could hook up to a water hose outside! Thanks for coming by! I need a shed with treasures like that in it. Great job restoring it – looks awesome! What a find! 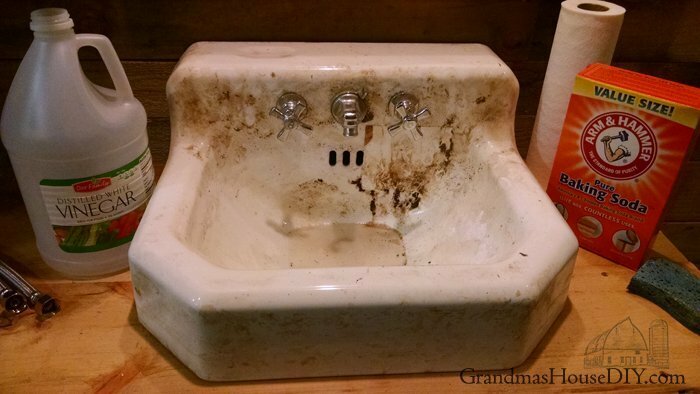 If you could get that clean, I can get my sink clean too! Thanks for coming to the party at Celebrate and Decorate! Thanks so much Jen! It’s not perfect but that’s basically what I love about it lol! What an incredible find! 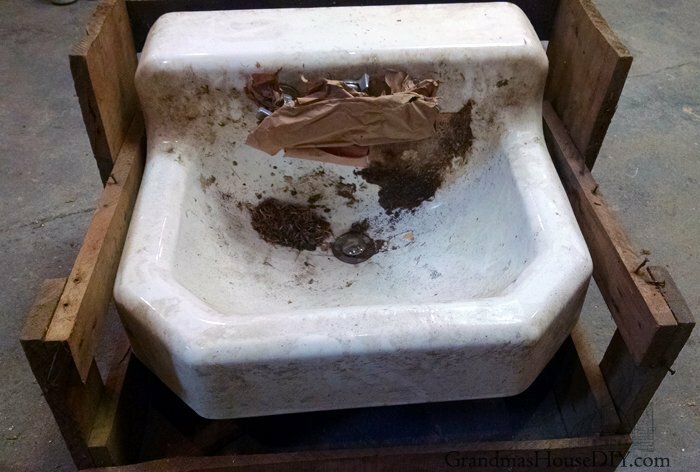 I can’t believe the sink was still in its old crate. Baking soda and vinegar are both fantastic cleaning solutions, and clearly together are a true powerhouse. Thanks for sharing at the #happynowlinkup! Baking soda is my favorite cleaning trick. It cleans everything. Ev-ery-thing. I’m glad to hear that Joe got home safely. 🙂 Thanks for sharing at the #ThisIsHowWeRoll Link Party. Thanks Susan! Yup baking soda is almost a miracle worker! Wow! That looks great. 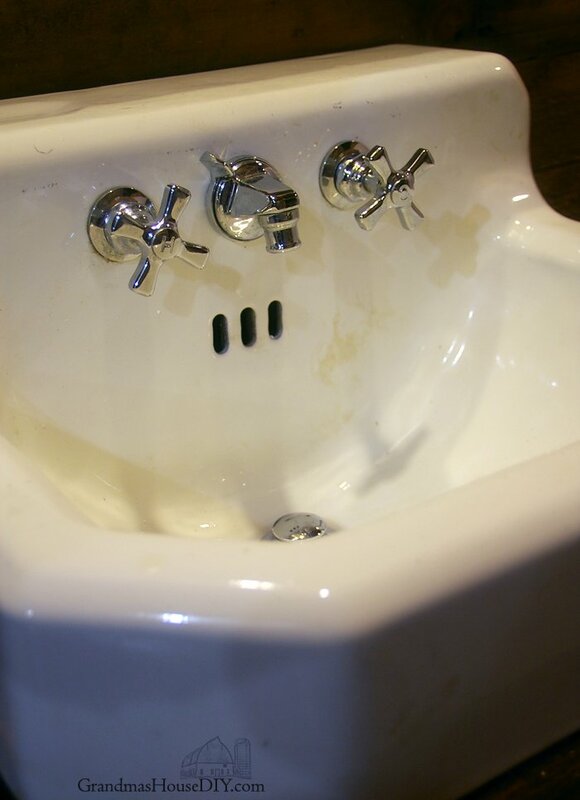 We have an identical sink in our shop bathroom. I love that they are more space saving with their shape and faucet. Unfortunately, ours looks more like your before picture than your after picture:/). Hadn’t thought about baking soda and vinegar. Not sure why not??? Will have to give it a go. Thanks. Wow that came out pretty great! Thanks for linking up at #MerryMonday! 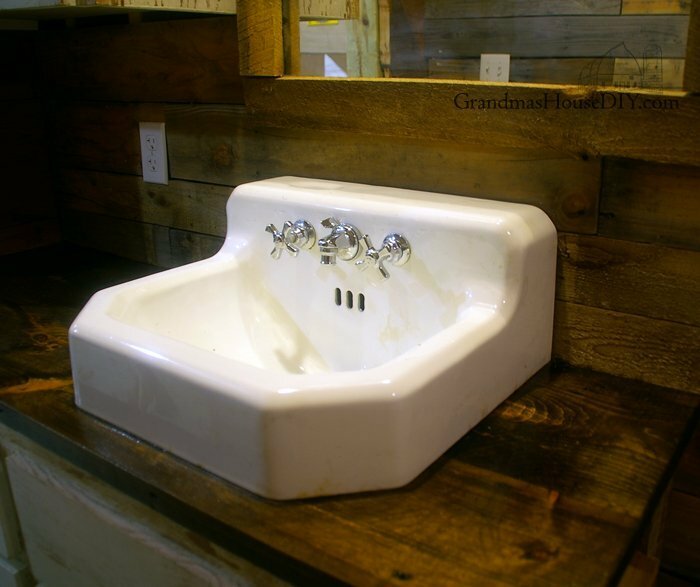 What a great look in your rustic vanity. Thanks for sharing at Home Sweet Home.